It's not Christmas without A Christmas Story. Since springing out of radio humorist Jean Shepherd's memoirs, the old yuletide tale has survived several reiterations and remained a holiday season staple. Most popular, of course, is Bob Clark's version, which you'll be able to watch over and over and over again on TBS, starting at 8pm this Christmas Eve. 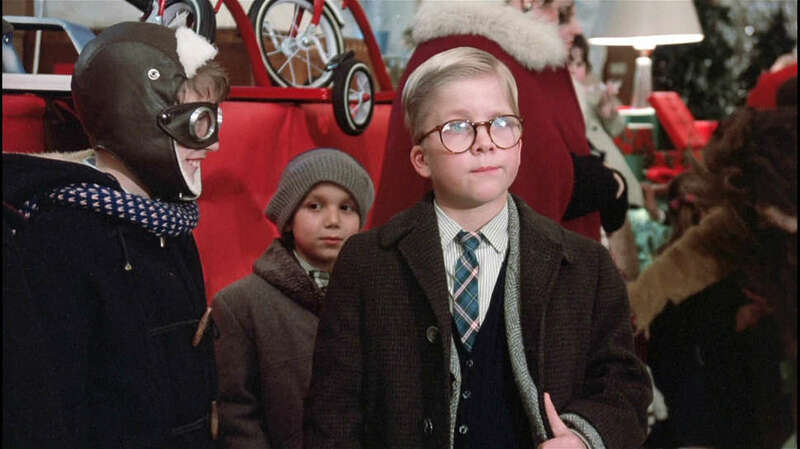 "The staying power of A Christmas Story is surreal," Patty Johnson LaFountaine, the actress who played Higbee’s Head Elf, told Ohio Magazine in 2013. "Today, child for child in every school where I teach, they, their parents, and grandparents know the movie. The fan base just keeps growing." What makes the 1983 film so immortal? The comedy's longevity, oddly enough, has lots to do with Clark, the famous B-movie director behind Porky's and Black Christmas, and his love for period pieces. He pulled from Shepherd's stories of growing up in suburban Indiana with care and leaned into the nostalgia of the '30s and '40s to capture a precise snapshot of Depression Americana -- a pivotal yet fleeting era, one that would come to be respected as much as it was feared. "Bob passed me an early version of the script to A Christmas Story," production designer Reuben Freed recalled for Ohio. "I thought it was the best thing I'd ever seen. I always believed Bob could be another Mark Twain, that he could be the storyteller for America." Though the movie wouldn't kill in theaters -- it was the 39th highest grossing movie of its year, according to Box Office Mojo -- it would hit HBO, get a Betamax release, and, propelled by its second-round audience, gain cult status. "There are many small but perfect moments in A Christmas Story, and one of the best comes after the Lifebouy [soap] is finally removed from Ralphie's mouth and he is sent off to bed. His mother studies the bar, thinks for a moment, and then sticks it in her own mouth, just to see what it tastes like. Moments like that are why some people watch A Christmas Story every holiday season," Roger Ebert wrote in 2000, when re-evaluating the movie. "There is a real knowledge of human nature beneath the comedy." Clark's movie has long boasted a reputation as a cheerful yuk-fest. Here at Thrillist, we like to think it also works as evocative horror. It comes colored with the kind of highly specific details and scenarios that are at once strangely unique yet easily relatable. "Few kid-centric comedies understand the very real terror of being a kid," note our critics -- especially during Christmastime. "The pole-licking, the trip to see Santa at the mall, and the eye-shooting-out finale all have a slightly grotesque, Norman Rockwell-meets-David Cronenberg edge to them." Even props like the "leg lamp," a Shepherd invention that made our list of the top 100 movie props of all time, continue to loom large and occupy a weird corner of pop culture. ("Bob told me he wanted The Old Man to be in the window with the lamp, and that it needed to be big enough to be seen from across the street," Freed's said. "So, it had to be the size of a human limb. I got a mannequin leg and asked costume designer Mary McLeod for input. She brought me a single pump, and I added fishnet stockings because that’s what a bad girl would wear. For the lampshade, I drew on an image from a comic book that had a '40s look to it. That was the easy part. The difficulty was creating something that would break on command, that we could have more than one of, that could be electrified and stand by itself.") In short, there's lots to like about Clark's movie and lots that's stood the test of time. The pic became so popular it would go on to spawn a pair of sequels, a series of TV movies, a stage adaptation, a Broadway musical, and, most recently, a live TV musical, which aired earlier this month on Fox. Despite strong performances by Ana Gasteyer and Jane Krakowski, the Fox production didn't go over well. It became the lowest-rated and least-watched of any live broadcast musical ever. The New York Times said it wasn't lively enough. And Vanity Fair wondered if it had signaled the end of the musical format entirely. Much of the ire seemed rooted in betrayal, like somehow an ambitious swing had tainted a classic. Not so. Here, old habits die hard. And for some families, watching the original movie has become inextricably linked with holiday tradition, putting it in league with classics like Home Alone and Miracle on 34th Street, and putting it in contention for title of THE Christmas movie alongside It's a Wonderful Life. "I'm not surprised at all" by the movie's longevity, Freed told Ohio. "The movie has wonderful values and speaks of the common man and the little boy we can all identify with." As you bundle up with TBS this year, just be careful not to marathon your eyes out.